In the story “The Mimiloo Zoo,” Kate’s trip to the zoo gets canceled because it’s raining, so it’s off to the fantasy world of Mimiloo! In Mimiloo, animals made out of bushes are being created for Gobble and Tack’s AMAZING new fruit garden inside their AMAZING new hedge maze. When Mim-Mim accidently spritzes the animals twice with Gobble’s powerful presto potion, they come to life and things quickly get wild! With the animals creating a bit of havoc, the gang needs to find a place for them to live and Kate knows the perfect location. This DVD also features the story “Lily and the Unicorn.” Lily has always wanted to see a unicorn, and now is the perfect time as beautiful shimmer flowers, which unicorns love to eat, are blooming. After searching all day, the gang final locates a whole garden of flowers. When the garden starts to float away, with Lily, who can save her? The DVD run time is approximately 65 minutes and its SRP is $12.99. The stories included within “THE MIMILOO ZOO” are below. Kate & Mim-Mim: The Mimiloo Zoo DVD is an absolute hoot! I have 3 girls and Kate & Mim-Mim is definitely one of their favorite shows. When I gave them this DVD they were super excited and asked to watch it right away. We just happened to be leaving the house to run a few errands so I thought it would be a great opportunity to let them watch it in the minivan between errands. Each episode is somewhat short which allowed me to run errands in between episodes perfectly. My kids love the fun characters in Kate & Mim-Mim: The Mimiloo Zoo and were thoroughly entertained. As a mom I love that Kate & Mim-Mim: The Mimiloo Zoo explores themes of friendship, adventure, and problem solving, “Kate & Mim-Mim” encourages children to use their imaginations and work together, believing no problem is ever too big to solve! 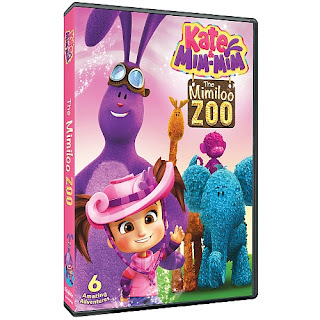 Kate & Mim-Mim: The Mimiloo Zoo DVD is an awesome DVD filled with tons of fun and I highly recommend it! You can order Kate & Mim-Mim: The Mimiloo Zoo DVD at Shop PBS, Amazon and other retailers.